With the latest flatscreen technology, images are transferred digitally from a DVI enabled computer. The picture is made up from thousands of discrete pixels ensuring picture perfect, very high resolution image control. AV2 DVI Enables a keyboard, mouse and DVI monitor to control 2 computers. Most connectors are rear mounted to ensure a neat installation and are colour coded according to the PC99 specification for easy identification. Keyboard and mouse ports use 6 pin mini-DIN female connectors. Video ports use standard 24-way DVI-D connectors. Options port is side mounted and uses 15-way standard D-type connector with proprietary pin allocation. DC power connector provided for video-only and other special applications where interface powering is not possible. - Front panel key for computer selection. - Numerical display shows selected computer and keyboard/mouse activity. - Optional remote controller connects to side. - Base-mounted reset and option switches. Computers may be selected using the front panel key, keyboard hotkeys, a three-button mouse or wheel mouse, RS232 data commands or the optional remote controller. The hotkeys are selectable and are designed to be quick-fire using a minimum number of key presses. The mouse may be used to select the next or previous computer by holding down the centre button whilst pressing the left or right button. Both keyboard hotkey and mouse switching may be independently disabled if required. When cycling through channels using the mouse or the hotkeys the user may configure the AdderView to select all ports or just the ports that have powered PCs attached. RS232 switching is useful for automated operation and the remote controller provides a convenient control method without locating the AdderView on the desk. The keyboard, mouse and video are switched together so that the keyboard and mouse are controlling the computer whose video is currently displayed on the monitor. Non-selected ports emulate the action of the keyboard and mouse so that the computer operates normally. 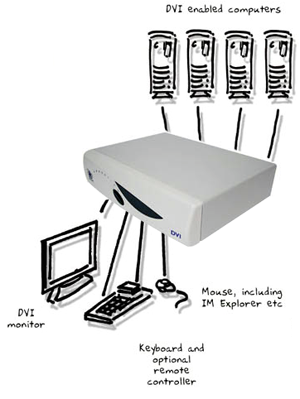 The AdderView DVI may be used to control more than 4 computers by connecting a computer port of one unit to the control port of another unit in a tree-like cascade. Automatic mode emulation and NUM / CAPS / SCROLL updates ensures that the keyboard is always in the expected state. Modes 1,2 and 3 are supported for full compatibility. Keyboard data is kept in its native format to ensure support for additional web control, hot media and other extra keys. The controlling PS/2 style mouse plugs directly into the AdderView. 2 and 3 button formats are supported. Most wheel and scroll mice are supported including the Microsoft IntelliMouse and IntelliMouse Explorer. PS/2 or RS232 mouse connections to computers may be made in any combination. RS232 mice require an additional cabling adaptor (VSA1). Prompt and stream mode support ensures maximum compatibility. 3 button mice or wheel mice may optionally be used to switch the AdderView's channel. Two or four single-link DVI ports operating up to 165MHz the full DVI Specification, VESA DDC2B signalling supported. AdderView extends DVI video cable runs by boosting the video signal. Flash upgradeable to support new devices by connecting a computer's serial port to the options port and running a download program. Software independent operation ensures very wide compatibility that includes Windows 3.X, WFWG, 95, 98, 2000, NT, ME, XP, DOS, Unix, Linux, NetWare, OS/2 and BSD. Hardware compatible with desktop and laptop PCs, RS6000, SGI and DEC Alphas. Plugs into the options port at the side of the AdderView. Duplicates the AdderView's front panel key and numerical display. May be attached to the top of a keyboard or the side of a monitor by the Velcro strips provided. 60 x 29 x 12 mm. White / cream finish. For maximum convenience the AdderView draws its power from the attached computers like a keyboard. Optional power socket provided for video only applications. Interface ports individually fused with auto resettable fuses to protect your computers. Attractive metal case 230 x 50 x 170 mm with moulded plastic fascia panel. Video circuit gold plated to enhance performance. 1.2 kgs. Complies with European directive 89/336/EEC. CE marked. FCC class A compliant.